About half the growth in GDP is due to population growth. Since the role of economic statistics is to help policy makers make informed decisions is including population growth in the GDP calculation is misleading. 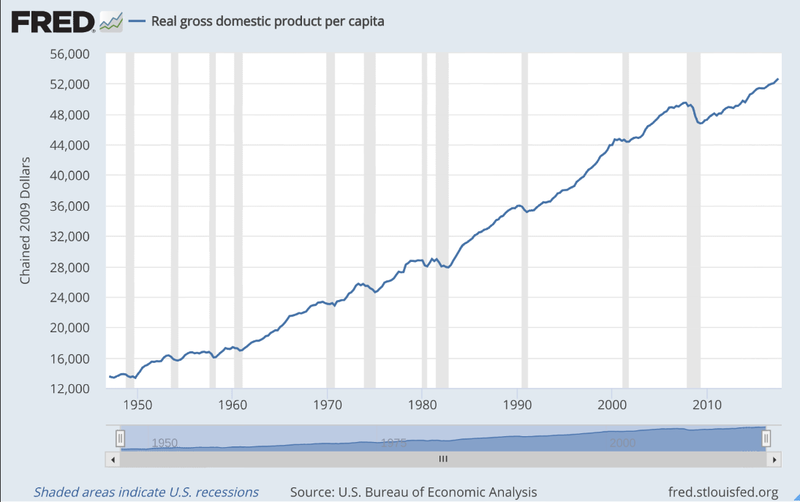 For the average American, on a per capita basis increases in GDP due to population growth is ZERO. In fact, one can argue that it is really a negative. For years, growth in GDP was better distributed throughout society. Today, we have few big winners and lots of losers. Most economic statistics do not show this distribution. One reason it took so many years for the inequality issue to come to the fore. Thoughts...how do we make economic statistics a better measure of how we are doing as a society?? And is the place to start with removing growth due to population from our GDP calculations?? There is GDP and there is per capita GDP. i think GDP due to government spending should be removed from the equation. not that i am an expert but it seems like if the government is spending tons of money and racking up debt it shouldnt be appearing as improvement in economic activity. you can say whatever you want but i am not going to say that. We have and need many more USD's today then in George Washington's time. So our federal gov't will have to do some money creation and spending along the way. Same as any modern and successful nation. We have and need many more USD's today then in George Washington's time. More transactions, from more people, more businesses, more global trade and world use of the USD, more savings, more investments and inflation.